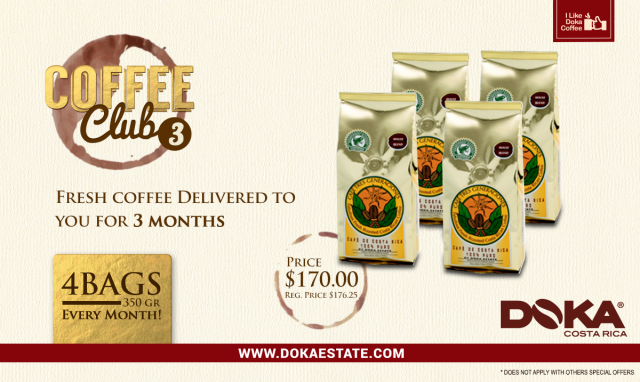 It’s easy to receive your favorite Doka Estate Coffee delivered regularly. We will bring you Fresh Roasted Costa Rican coffee to your door as often as you would like. If you want to enjoy monthly 3 bags of 500 grams during 3 months for only $175.00 with shipping and handling included, please choose your favorite roast or try them all. On your first shipment you will get an extra bag and a SURPRISE GIFT completely FREE. Note: Peaberry and Decaffeinated is $1.00 extra per bag ordered. If you need to make a change on your order please specify under the comments area at your form. It’s easy to receive your favorite Doka Estate Coffee delivered regularly. We will bring you Fresh Roasted Costa Rican coffee to your door as often as you would like. If you want to enjoy monthly 4 bags of 350 grams during 3 months for only $170.00 with shipping and handling included, please choose your favorite roast or try them all. On your first shipment you will get an extra bag and a SURPRISE GIFT completely FREE. Note: Decaffeinated bags are 250 grams and Peaberry is $1.00 extra per bag ordered. If you need to make a change on your order please specify under the comments area at your form. 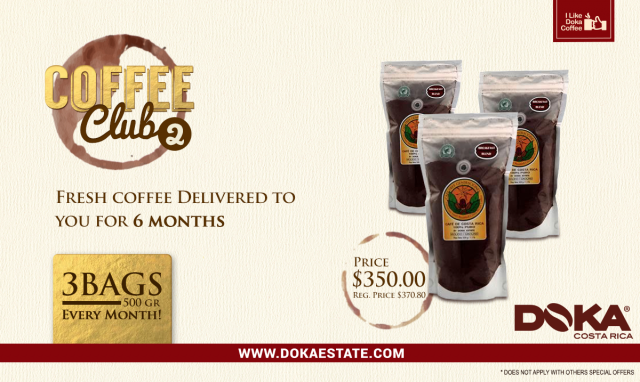 It’s easy to receive your favorite Doka Estate Coffee delivered regularly. We will bring you Fresh Roasted Costa Rican coffee to your door as often as you would like. If you want to enjoy monthly 3 bags of 500 grams during 6 month for only $350.00 with shipping and handling included, please choose your favorite roast or try them all. On your first shipment you will get an extra bag and SURPRISE GIFT completely FREE. Note: Peaberry and Decaffeinated is $1.00 extra per bag ordered. If you need to make a change on your order please specify under the comments area at your form. It’s easy to receive your favorite Doka Estate Coffee delivered regularly. We will bring you Fresh Roasted Costa Rican coffee to your door as often as you would like. If you want to enjoy monthly 4 bags of 350 grams during 6 months for only $340.00 with shipping and handling included, please choose your favorite roast or try them all. On your first shipment you will get an extra bag and a SURPRISE GIFT completely FREE. Note: Decaffeinated bags are 250 grams and Peaberry is $1.00 extra per bag ordered. If you need to make a change on your order please specify under the comments area at your form.